How many members of your current RMIS vendor’s service team have come and gone over the course of your relationship? What about the number of service team leads who have guided support efforts on behalf of you and the other users of your RMIS software? When you dial into a meeting and get introduced to yet another service team replacement, your RMIS provider is under-delivering. Many business-to-business software providers place far too much emphasis on “software” and not enough on “service.” In terms of features and functionalities, the results of such an approach may be impressive. But the imbalance comes with a cost. Subpar support is always detrimental to client success. The importance of consistent, knowledgeable RMIS technology support is difficult to overstate. Given the increasingly complex risks every business faces and the ever-expanding role risk managers play within their organizations, a platform implemented five or more years ago may struggle to keep pace with an organization’s changing needs. A revolving door of service team personnel who need to be brought up to speed on the unique aspects of a RMIS and the risk management program it was put into place to support compounds the problem. Winter Storm Harper took its toll on large parts of the Midwest and Northeast, causing several deaths, hundreds of car accidents, and power outages that affected tens of thousands, according to the Weather Channel. Extreme weather—from blizzards to hurricanes to wildfires—wreaks havoc on businesses in every region of the country, with damage having a lasting effect. In fact, according to the Insurance Institute for Business & Home Security, 40% of small businesses do not reopen after a severe weather event. This is in part due to a failure to have an actionable plan in place. As we discussed in Step up your disaster preparedness, don’t wait for the news report, organizations can get tripped up when there’s confusion over who should act and what those actions should be during a weather crisis. Without clear plans, practice, and timely alerts, critical resources may fail to execute. Origami’s cloud-based RMIS continues to make weather preparedness a priority. With our new proximity search feature, audit functionality, and flexible data integration, you’ll be able to quickly identify major weather risks and effectively communicate how key parties can take action. Creating a strong safety culture can be challenging for any organization. Recent regulatory changes are placing an organization’s safety culture under additional scrutiny. In the EHS Today article The Risks of Using Injury and Illness Reporting as Measurements of Success, Mark Kozeal discusses how an OSHA rule change penalizes those with cultures that discourage reporting. “Under OSHA’s update to its 2016 rule on recording and reporting workplace injuries and illnesses, such programs would be in violation of the law,” Kozeal notes. “Whether this incentivized culture was purposeful or inadvertent doesn’t matter. What matters is that any practice that incentivizes employees for not reporting an injury or illness or denies employees incentives if they report an illness or injury, can now be cited by OSHA.” This means that a poor safety culture can now affect the bottom line. There is no quick fix when it comes addressing the factors that inhibit reporting. However, taking a number of practical steps that include making it easier to submit reports (addressing practicality) and allowing for anonymous reporting (reducing fear) can be a foundation upon which to build an effective safety program. With more data to draw from, the ability of risk managers and safety professionals to identify, analyze, and take strategic action to reduce the likelihood of injury is vastly improved. Over time, this can contribute to a breakdown in perceptions of uselessness and acceptance of risk. The responses to a recent Deloitte-commissioned survey of 300 in-house legal executives contain good news for those working closely with in-house legal departments on risk management and compliance-related issues. An executive summary of survey results, Going beyond risk and compliance: Enabling the Legal function to embrace digital transformation, indicates that a majority of respondents feel that in-house legal departments are aware of and open to the use of technology in efforts to make risk management and compliance more efficient and cost-effective. When choosing a risk management information system (RMIS) or making a RMIS switch, the process of assessing systems sometimes feels like comparing apples to apples. As important as the big functionalities are, organizations would do well to look at the more granular details—details that, however simple they may seem, address their organization’s very specific needs, while also saving time and preventing mental fatigue. As a Risk Management Monitor article says, “An effective relationship starts with knowing the specific requirements of your enterprise and setting relevant priorities” and then checking how closely your RMIS provider can match them. The workforce today puts in longer hours, more days a week than ever before. But employees aren’t spending all of that time tackling more projects and setting more goals, as one might expect. The 2018 survey Companies Are Overlooking a Primary Area for Growth and Efficiency: Their Managers found that 36% of company managers spend 3 to 4 hours per day on administrative tasks. An employee who spends an hour manually entering data or emailing colleagues about upcoming tasks is using time that could be better spent on more valuable activities like interacting with clients and improving product offerings. It’s not exactly a secret: Regardless of size or industry, every organization stands to benefit from using automation technology to cut down on repetitive, time-consuming administrative tasks. More than simply speeding up a process or getting people to work faster, automating administrative tasks yields value by freeing up employees to focus on the aspects of their job that really matter and provide value. Automation is wonderful. Except when it isn’t. As covered in Behind the Hype of Robotic Process Automation (RPA), businesses can run into issues by rushing to reduce costs and improve productivity through automating processes without first evaluating their effectiveness and necessity. The benefits of automating repeatable, administrative tasks can also be lost if automation technology is too difficult to use. The result? Time that could be used performing more high-value activities winds up spent managing software. Data Breach Today offers predictions in What’s Ahead for Health Data Privacy, Security in 2019? While the article focuses primarily on health data, a few key trends apply more broadly and are likely to resonate with all types of organizations. Rebecca Herold, author of 19 books on information security and CEO of The Privacy Professor consultancy, begins the list of predictions by examining the potential for agency updates to HIPAA. “Based on continued pressure from local, state and federal government agencies, law enforcement, researchers and others to ease the sharing of patient and mental health data by removing the need to obtain patient consent, I expect to see OCR issue proposed HIPAA updates,” she notes. For risk and safety professionals, the new calendar year brings with it a renewed focus on improving their organization’s culture of safety. Whether looking to put a new safety program in place, make wholesale changes to an existing program, or build upon previous successes, many organizations face the challenge of ensuring that their employees are fully participating in safety efforts. A recent EHS Today article takes a look at a potential solution for involving people across an organization in this process: safety assessments. To Build Safety Culture, You Must Get People Talking provides an overview of a 2018 Safety Leadership Conference session — “Distracted Drivers R US — Assessment RX for Success” — led by Walter Fluharty, vice president of EHS and organizational development at Ohio-based Simon Roofing. Where static surveys may be seen as yet another safety-related requirement, focus group-based assessments followed by the completion of self-assessments are more likely to drive engagement and add value. 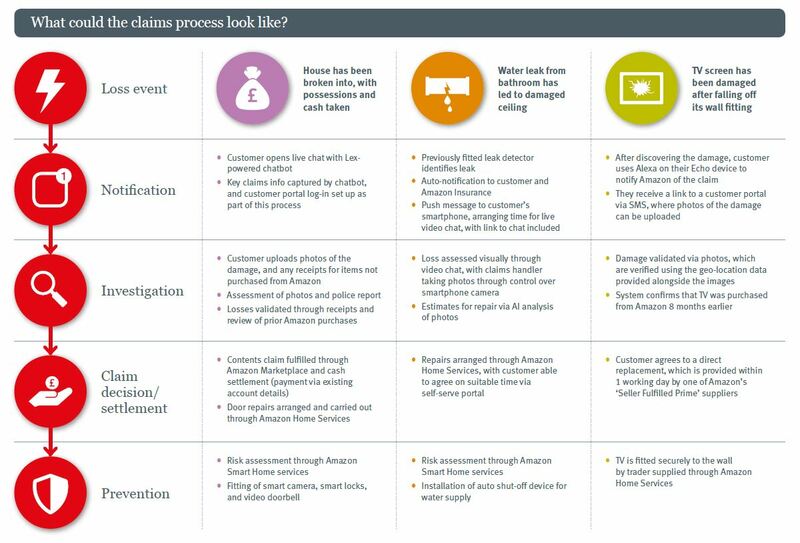 What does it mean for you if Amazon offers claims management? One of the Claims Journal’s most popular articles of 2018 covered the Altus report that investigated the possibility of Amazon entering the claims management sector. The fact that Amazon tried to poach employees from Lemonade and recruit for a new product manager position certainly provided enough circumstantial evidence to fire up the rumor mill. The report highlights some of the advantages Amazon brings to the table. The customer-facing infrastructure — from Alexa and Echo devices to an online juggernaut offering an expansive consumer marketplace and digital media center — is unlike anything currently in the insurance space. In addition, Amazon Home Services, which offers on-demand repairs and potential assistance with installing large replacement goods; its array of supported smart home devices; and its direct access to customer purchase history make the company poised to completely transform the claims management process.